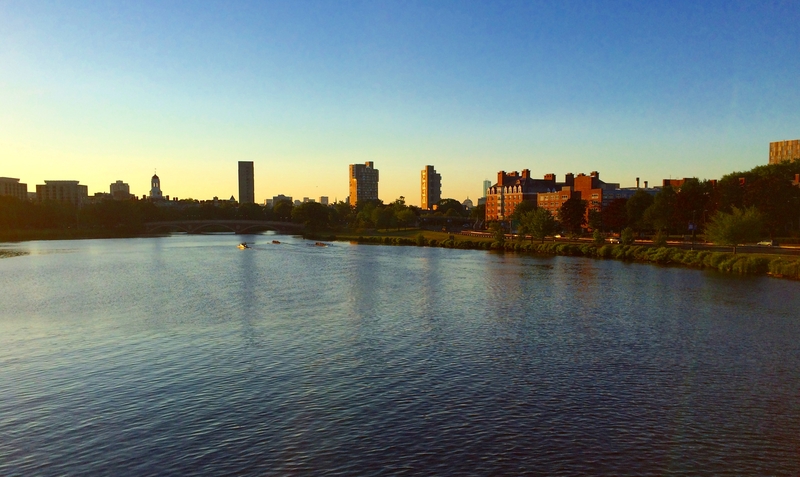 Spent your summer tackling new work projects, stealing a few long-weekends and catching up on your reading list? Your Tulane Law professors’ summers haven’t been so different from yours. Find out what they’re working on, where they’ve traveled and what must-read books they recommend before school starts back. 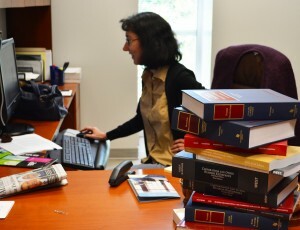 Gordon Gamm Faculty Scholar, an award that boosts early-career law professors. And the Class of 2015 voted her winner of the Felix Frankfurter Distinguished Teaching Award, the law school’s highest teaching honor. her “break” with projects and travel, while finding creative ideas to enjoy New Orleans. 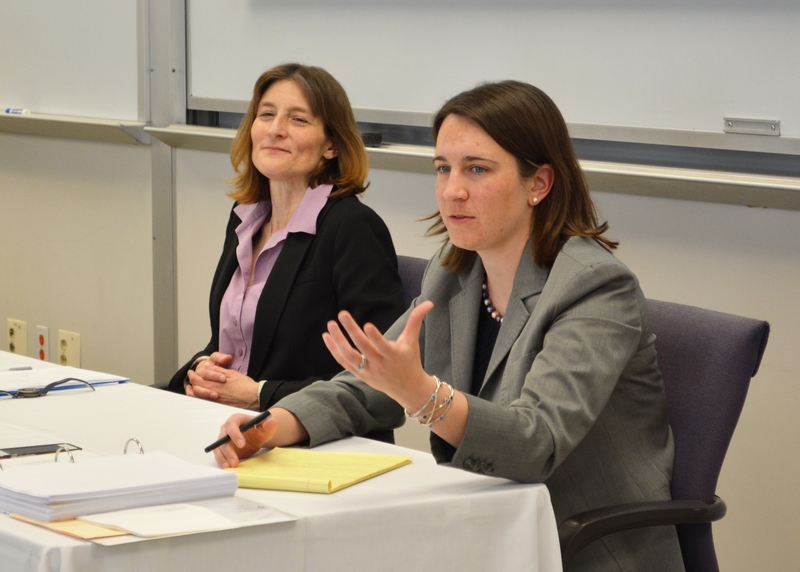 Richardson’s summer scholarship took her to the Association for Law, Property & Society annual meeting at University of Georgia School of Law, where she presented the first stages of her scholarship rethinking adverse possession. 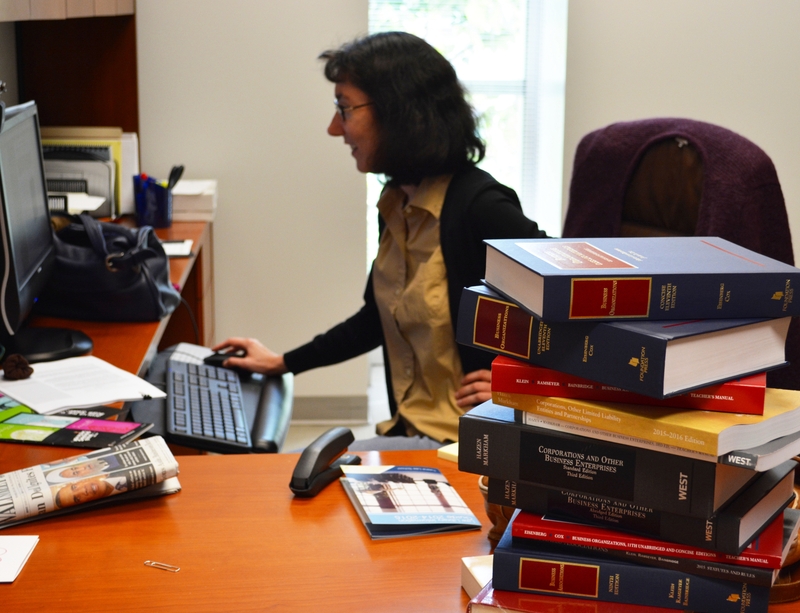 As the core of her research, she plans to survey recent good- and bad-faith property possession cases – which will require reading 2000 appellate decisions during the spring 2016 semester. She presented an early version of her paper at ALPS to get feedback on her methodology from property scholars nationwide. In June, she traveled to Boston to present her research at the Junior Faculty Forum, a showcase sponsored by Harvard, Stanford and Yale law schools. This year’s conference featured 16 papers selected through national blind judging, and the presenters got feedback from senior scholars from the three sponsor schools, plus University of Pennsylvania and New York, Columbia and Boston universities. Prof. Sally Richardson walked the Anderson Memorial Bridge, taking in scenic views of the Charles River and Harvard’s campus during the Junior Faculty Forum. She’s also continuing thought-provoking research on modern couples’ privacy rights, such as whether spouses have a right to read each other’s texts and emails — a particular issue in community property states, where anything created during a marriage is co-owned. Richardson reads extensively on property, civil and comparative law at work, but for vacation, she picks up Victorian literature. “If it’s a book set in the 1920s or 1930s with a female protagonist, I’m going to read it,” she said. She scouts the New York Times bestsellers list for new books and recently finished “The Rules of Civility,” which she highly recommends. “The last 50 pages or so were a bit depressing compared to the preceding 250 pages, but that’s typically what you get with this genre,” she joked. 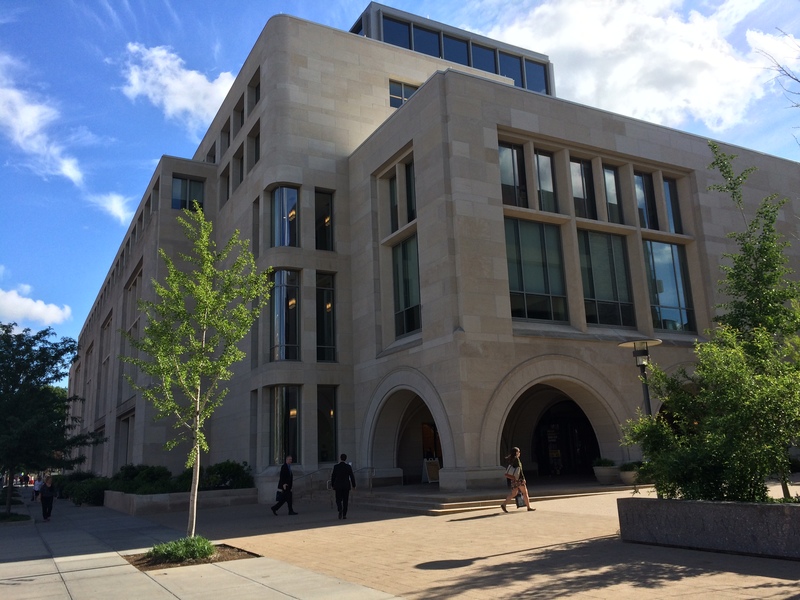 Prof. Sally Richardson visited Harvard Law School’s Wasserstein Hall to present “Reframing Ameliorative Waste” at the Junior Faculty Forum. “I’ve actually been swimming early almost every morning at the Reily Center, which I love – although I’m usually the youngest person there at that hour,” Richardson said. Second, ride a bike. Richardson said she cycles through Audubon Park before swimming most mornings. For a simple, enjoyable route, she recommends riding down St. Charles (which is newly repaved and has ample bike lanes), looping around the park and then heading to Tulane’s campus. Third, cool off with afternoon cocktails. Richardson recommends the city’s myriad free tasting events. Among her favorite places: Avenue Pub, where she recently sampled inventive ciders, including a pineapple-flavored version; St. James Cheese Company, where foodies can try wine-and-cheese pairings once a month; and Hopper’s Carte des Vins, which holds free Saturday afternoon wine tastings. 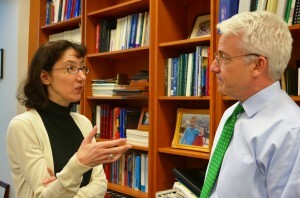 The law school’s newest faculty member, Professor Ann Lipton has formidable business and securities law expertise.She clerked for U.S. Supreme Court Justice David Souter before he retired, practiced as a securities litigator in New York for more than 11 years and taught at Duke Law School for two years before joining Tulane. 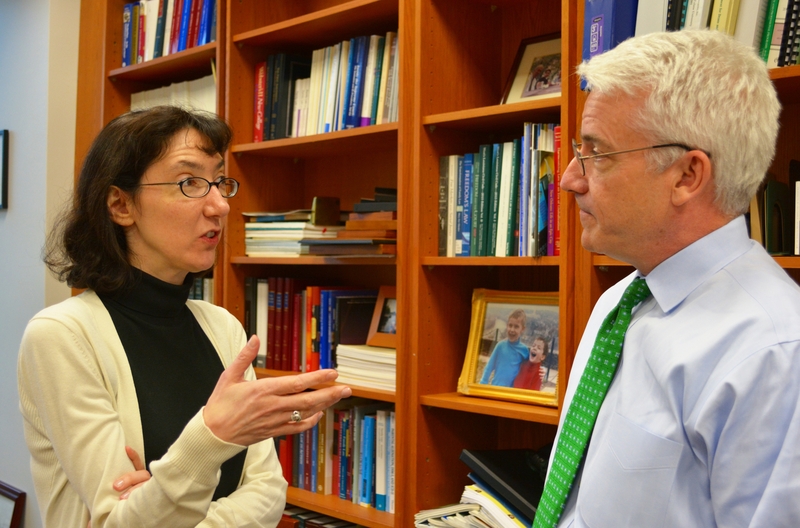 Prof. Ann Lipton (pictured with Dean David Meyer) joins the Tulane Law faculty for the fall 2015 semester. After moving to New Orleans in late May, Lipton has spent the bulk of her summer emptying boxes and getting settled – a process to which many incoming Tulane Law students can relate. “I’ve been unpacking in small doses to make it more manageable, but I still have boxes everywhere despite being here for more than a month already,” she said. She’s also learning to navigate narrow uptown streets. Lipton said New Orleans driving has been challenging, coming from the wide roads and extensive highways of Durham, North Carolina. After working exclusively in urban areas for the bulk of her career, she learned to drive in Manhattan just two years ago, in preparation for her Duke professorship. When she’s not unpacking and sorting, Lipton has been planning her first class, Business Enterprises, which she’s teaching this fall. As part of her preparations, she’s picking the casebook by carefully reviewing — in just two months — more than 10 Business Enterprises textbooks and manuals available. She sees it as due diligence to check all the options. Prof. Ann Lipton prepares for her first Business Enterprises class at Tulane Law. Lipton she said she’s enjoying getting settled in the Tulane Law community. Weekly faculty lunch seminars have allowed her to discuss her ongoing research along with colleagues’ projects. And she got her first taste of campus life seeing “The Importance of Being Earnest” at the New Orleans Shakespeare Festival at Tulane with Professor Catherine Hancock. 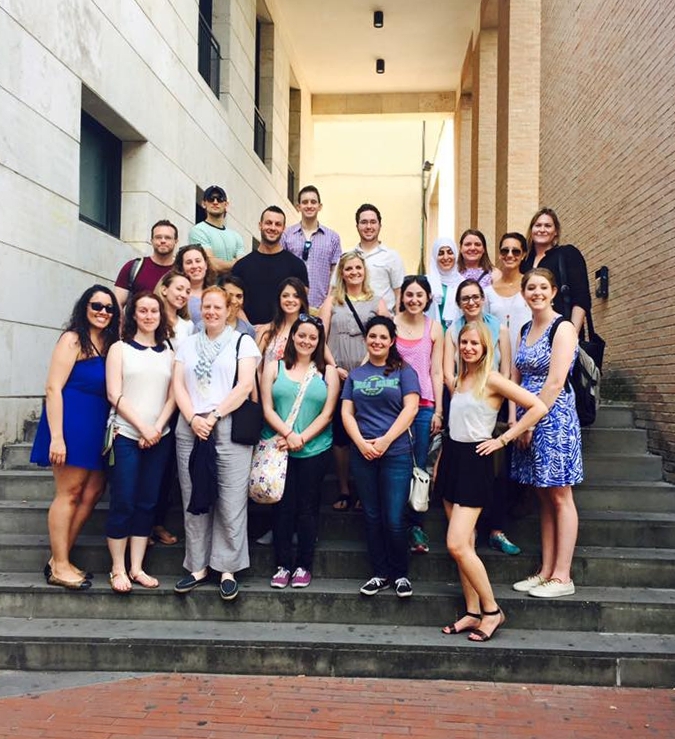 Tulane Siena summer abroad students learn art and cultural property law at University of Siena Facoltà di Giurisprudenz. As Tulane Law’s international legal programs director, Professor Herb Larson oversees all summer programs abroad. He also leads one of those programs, the Tulane-Siena Institute for International Law, Cultural Heritage & the Arts, where students analyze the law of international art preservation, dealing and protection. 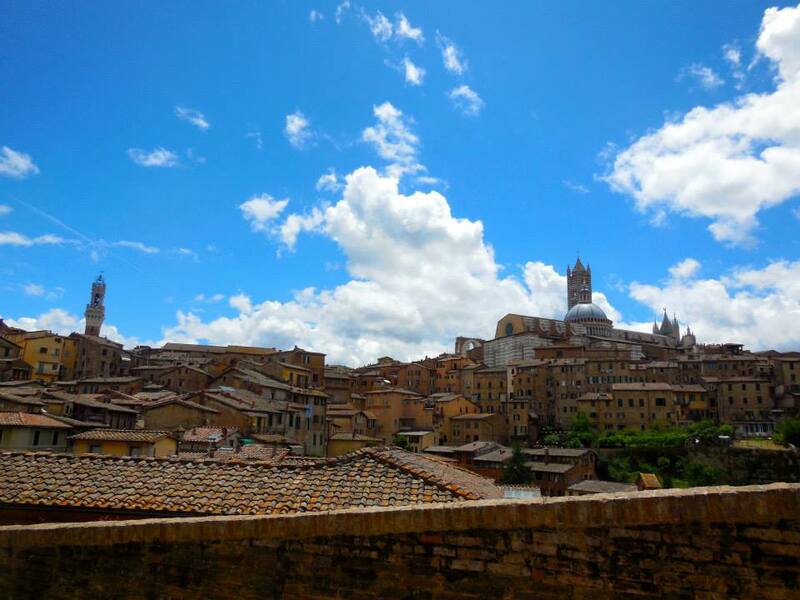 Larson spent June overseeing and teaching in picturesque Siena, Italy, where Tulane’s summer abroad program explores legal mechanisms for protecting “cultural property” – a broad term encompassing a civilization’s art, architecture and antiquities. Modern art and cultural property scholarship focuses on preserving objects from a spectrum of threats, including wars, environmental disasters, looting, pollution and degradation over time. The Siena program, which Larson calls “the best of its kind in the world,” explores the complex, evolving field from competing viewpoints of different stakeholders, such as collectors, museum curators, art dealers, archaeologists and governments. The program is open to law students and graduate students studying art, archaeology, art history and anthropology, plus practicing attorneys. Larson re-established Tulane’s Italian summer abroad program after a two-year hiatus following Hurricane Katrina. 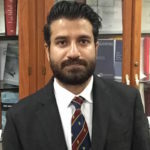 Recognizing international growth in the field, he refocused the program on art and cultural property law. 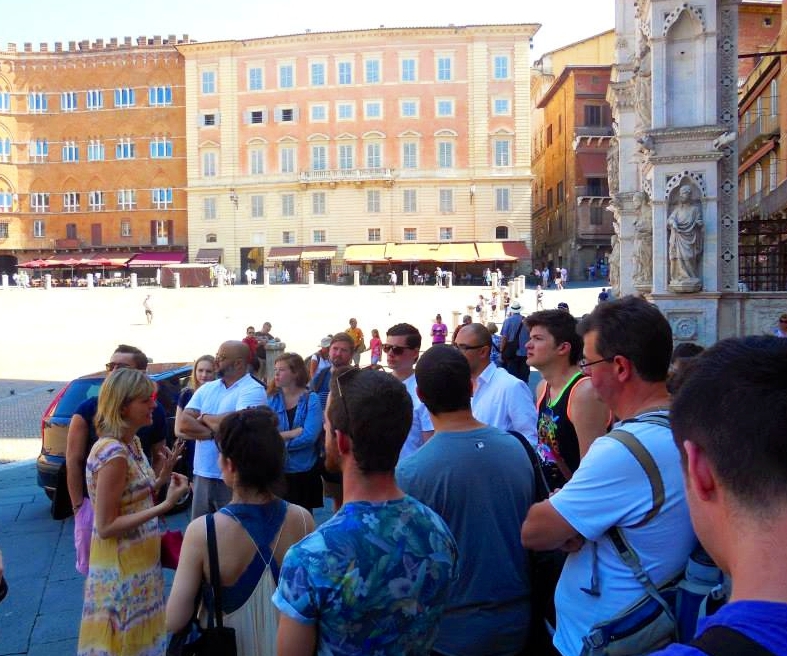 Prof. Herb Larson directs Tulane’s summer abroad program in Siena – a picturesque, 16th-century town surrounded by historic walls and gates. This summer, he taught a course on the black art market and co-directed the program with Patty Gerstenblith of DePaul University College of Law, who is President Obama’s appointed chair of the U.S. Cultural Property Advisory Committee. Students gather outside the Palazzo Publico before touring the Museo Civico and Pinacoteca Nazionale museums and Siena’s Duomo. 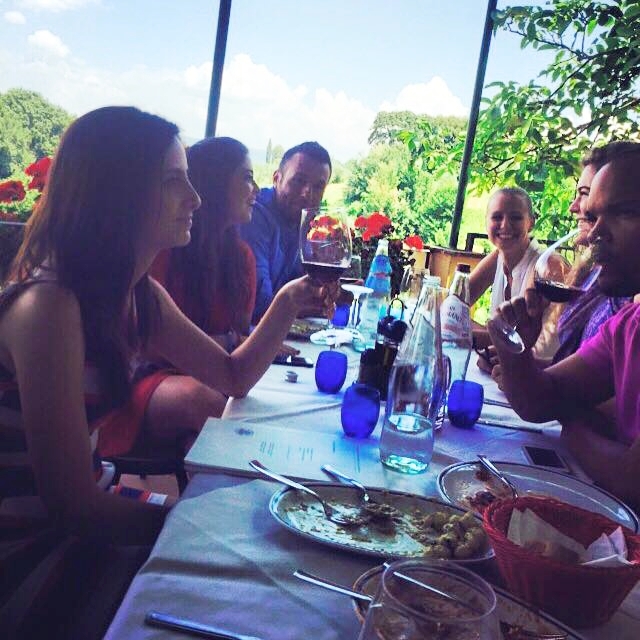 The program’s idyllic setting also provided memorable study breaks: Sampling gelato at Piazza del Campo’s bustling cafes; listening to classical music and Italian opera at free concerts; and taking weekend excursions across Tuscany. Larson said he hadn’t taught the entire Siena program in year, but it didn’t take much convincing to get him back. “If you make me go to Tuscany to be surrounded by art, eat wonderful Italian food and drink wine in a beautiful setting for the month of June, I’ll do it,” he said. Larson also spent a week vacationing in Portugal with his wife, on a trip designed by Portuguese native Maria Landry, Tulane Law’s assistant director for international and graduate programs. Back in New Orleans, Larson has carried on his cultural property scholarship, working on a position paper for The Antiquities Coalition that advocates creating a private right of action to prosecute art theft under the National Stolen Property Act. 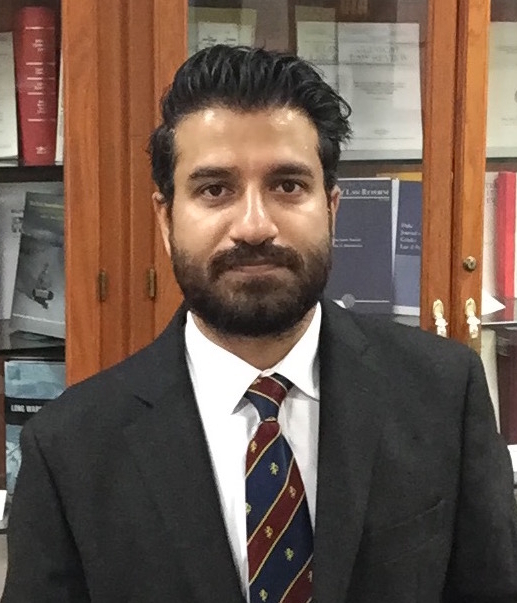 Empowering civil litigants to sue and recover for stolen art would bolster the fight against cultural property theft by shifting some of the prosecution burden from already-overloaded law enforcement, he explained. Siena program students explore Tuscany’s best sights, food and culture on weekend trips to surrounding towns. Larson’s recommendation continues the stolen-art theme: “The Lady in Gold,” a nonfiction account of a woman’s fight to recover paintings stolen from her family by the Nazis during World War II, including a Gustav Klimt portrait of her aunt. The story was adapted into a movie, “The Woman in Gold,” starring Helen Mirren and Ryan Reynolds. “It’s a great read for any law student, because the lawyer is actually the hero in the end,” Larson said. This entry was posted in International law, Law professors, New Orleans, Study abroad on July 22, 2015 by tlslagniappe. 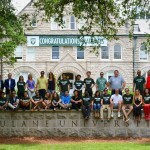 Happy summer, and congratulations to the Tulane Law Class of 2015! It’s only been one week since Commencement, and we’re already missing our students at Weinmann Hall. 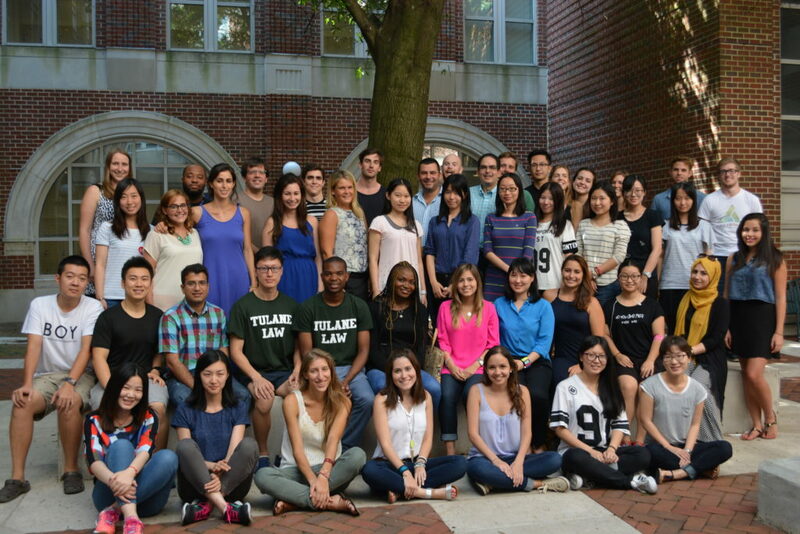 But as we reflect on a spring semester packed with one-of-a-kind experiences and celebrations, spanning events such as the Summit on Environmental Law & Policy to Thank You Thursdays, we’re prouder than ever to be part of the Tulane Law community. And we can’t wait to do it all again next year. Boot camp criminal track students argue motions to suppress evidence before Judge Byron Williams (L ’87) at Orleans Parish Criminal District Court. 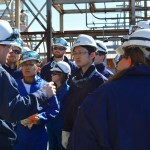 Environmental and energy law students tour Valero’s St. Charles Refinery to explore its business and legal operations. Baseball agent Marc Kligman (L ’95) judges the 8th Annual National Baseball Arbitration Competition, which draws sports law students and execs nationwide. Even at 8:30 a.m., students have access to the Tulane Law administration! 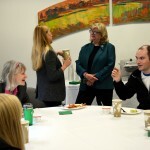 Coffee with the Deans fosters discussion among students and faculty each semester. 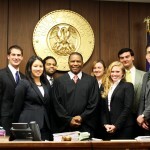 Federal Bar Association student chapter officers meet with 5th U.S. 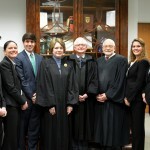 Circuit Court of Appeals Judges Edith Brown Clement (L ’73), Jacques Wiener (L ’61) and E. Grady Jolly before the judges hear oral arguments at Tulane Law. 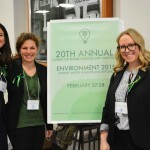 Environmental law students Amanda Serfess, Rachael Waxler and Emily Prince (all L ’16) help run the 20th Annual Summit on Environmental Law and Policy. Micah Zeno (L ’15), Anjana Turner (L ’17) and Alexis Ruiz (L ’16) kick off Thank You Thursdays, Honor Board-sponsored events to promote gratitude in the Tulane Law community. 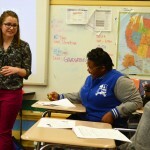 Emily Von Qualen (L ’16) teaches tax basics to New Orleans high schoolers through Prof. Marjorie Kornhauser’s TaxJazz program. 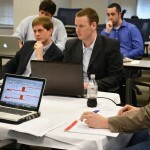 Sanders Phelps and Channing White (both L ’16) take on the final round of the first Pro Football Negotiation Competition. 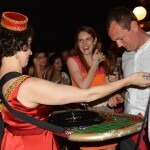 Prof. Pamela Metzger deals roulette to Janelle Sharer (L ’16) and Andrew Cox (L ’17) at the Public Interest Law Foundation’s Casino Royale-themed auction fundraiser. 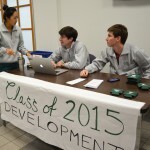 Geena Yu, Graham Williams and Ryan Feder (all L ’15) fundraise for a record-setting class gift. 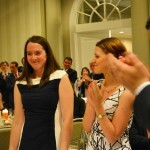 Tulane Law Review Senior Managing Editor Meghan Marchetti (L ’15) and other review members are recognized for their contributions to the journal at its annual banquet. 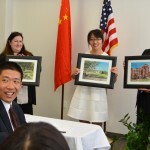 Shiwan Cui (LLM ’15) displays her watercolor paintings of Tulane’s campus for visiting Chinese judges. 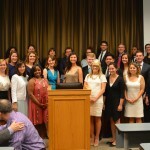 LLM students commemorate their last week on campus with a trip to Gibson Hall off St. Charles Avenue. 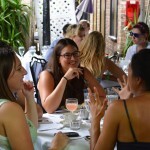 Elizabeth Wagner celebrates with friends at a Grad Week brunch sponsored by the Class of 2015. 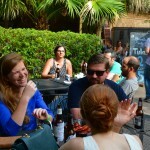 Meghan McVeagh and Shane Exon (both L ’15) relax over crawfish and cameraderie during Grad Week. Dean David Meyer congratulates Demetrius Sumner, Alston Walker, Graham Williams and Micah Zeno (all L ’15), winners of prestigious university-wide awards. Top Class of 2015 students are honored with awards for excellence in academics, leadership and public service. Caroline Bordelon and Khalil Bou-Mikael (both L ’15) say goodbye to Weinmann Hall. 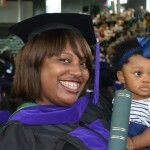 Carlene Service (L ’15) smiles with her daughter after receiving her Tulane Law diploma. Class of 2015 grads Christopher James and Xiaomei Li celebrate commencement. PS: Don’t be strangers! Share your summer experiences with us on social media using #TulaneLawSummer. 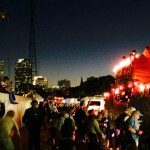 This entry was posted in New Orleans, Student life on May 21, 2015 by tlslagniappe. For anyone living in New Orleans, there’s no escaping Mardi Gras. It all begins with red-and-green holiday decorations giving way to purple, green and gold everywhere. King cakes — decadent and delicious — start appearing at school, work and parties. Before long, parades begin marching through every major neighborhood, and it’s nearly impossible to stay away from the colorful sights and joyful sounds. Tulane Law students can’t escape Mardi Gras, either — and there’s no reason they’d want to. 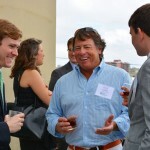 Read on for the best of Mardi Gras around Tulane Law School this year. Mardi Gras Indians prepare to second line for the funeral of Theodore “Bo” Dollis, Big Chief of the Wild Magnolias, two weeks before Mardi Gras. Photo by Januar Putra. 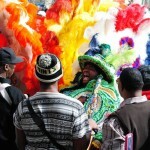 A sampling of clever, colorful throws caught during Mardi Gras weekend. Photo by Dennis Zhao. 1. 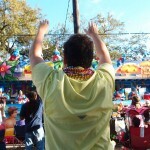 Mardi Gras is more than a single day of celebration. Carnival season lasts several weeks, and Weinmann Hall feels the festive spirit long before Fat Tuesday. Tulane Law Review students Austin Priddy (L ’15), Meghan Marchetti (L ’15), Alston Walker (L ’15), Libby McIntosh (L ’15), Laura Cannon (L ’16), Meghan Dupre (L ’16), Kathryn Hasting (L ’16) and Jeff Gelpi (L ’15) infuse a little Mardi Gras spirit into their work. 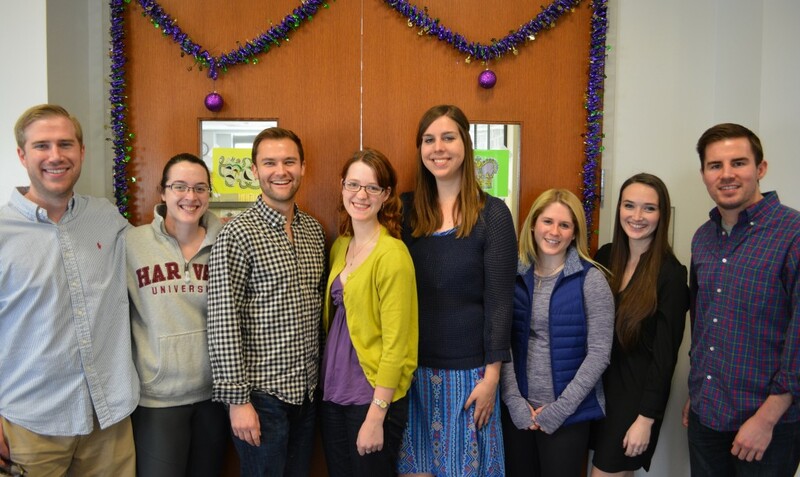 Tulane Law Review members have been reviewing scholarly articles all year, but for the past few weeks, they did so surrounded by festive Mardi Gras decorations and king cake. Junior Member Laura Cannon (L ’16) brightened up the law review suite with purple, green and gold garlands and banners, while other law review members contributed countless king cakes throughout carnival season. “We’re in the law review suite so much that it’s become like a second home. I thought the decorations would make this a happier place for all of us to be during Mardi Gras,” Laura said. The Dictator took over Adjunct Professor Mike Butterworth’s admiralty class days before Mardi Gras. “The Dictator is nobody to trifle with,” Butterwoth said. Photo by Dennis Zhao. 2. 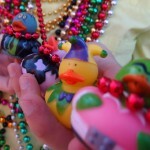 The parade route isn’t the only place to catch beads during Mardi Gras. 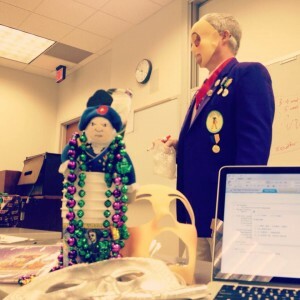 Someone calling himself The Dictator invaded Adjunct Professor Mike Butterworth’s (L ‘89) class Thursday before Mardi Gras, throwing beads and overriding the lesson plan. Prof. Butterworth says he was not in class that day because he had been warned to avoid The Dictator’s takeover of his Carriage of Goods by Sea admiralty class. masked man’s identity remains a mystery. 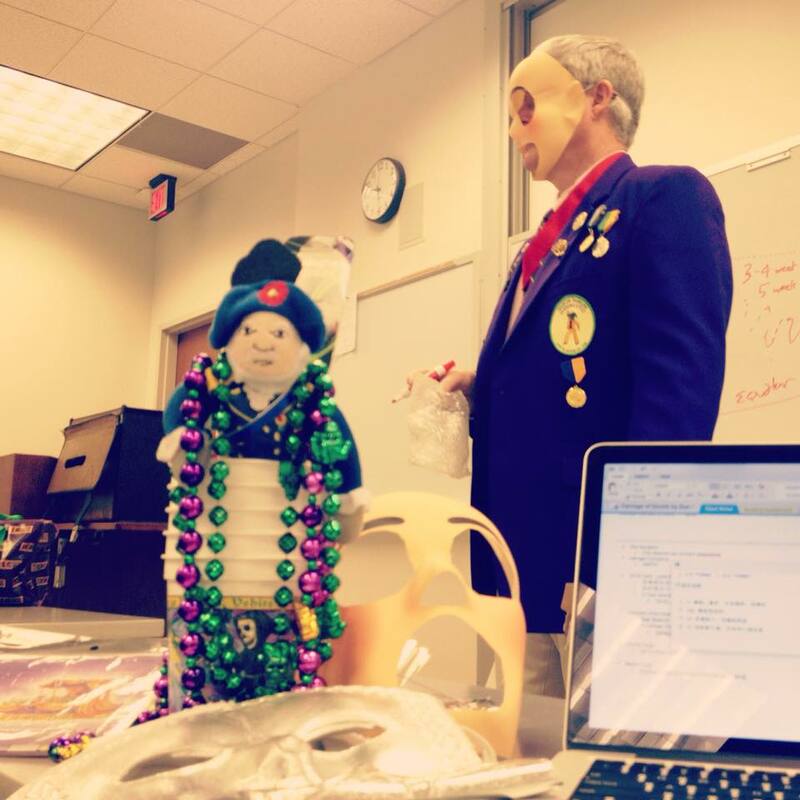 It cannot be confirmed or denied whether Prof. Butterworth himself is a member of any Mardi Gras krewes at this time. 3. 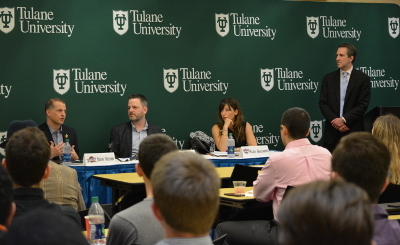 The annual Mardi Gras Sports Law Invitational draws law students nationwide and is Tulane’s leading invitational moot court competition. 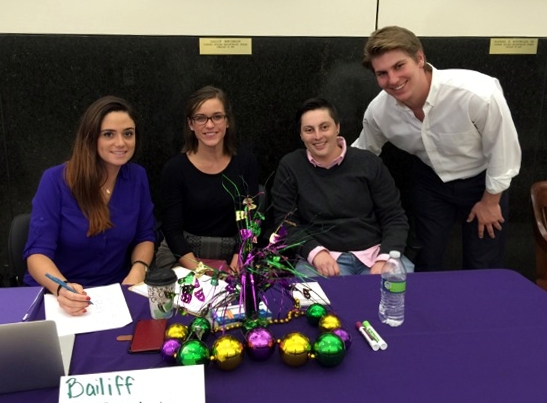 Moot court volunteers Shauna DiGiovanni (L ’15), Jennifer David (L ’16), Jaimie Riggs (L ’15) and Kevin Koskovich (L ’16) help run the Mardi Gras Invitational competition. Photo courtesy of Shauna DiGiovanni. 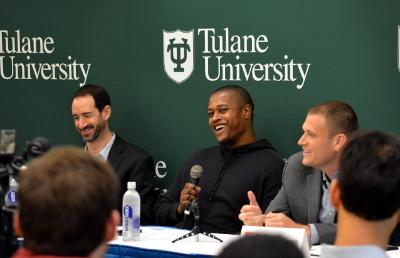 During the Mardi Gras Invitational, student competitors argued both sides of current and complex topics in sports law, a key area of focus at Tulane Law School. This year’s problem tackled issues surrounding the legalization of sports gambling and an MLB franchise relocation under baseball’s antitrust exemption. The invitational drew approximately 95 competitors from 32 law schools throughout the country, and they were judged by attorneys and judges in each round. 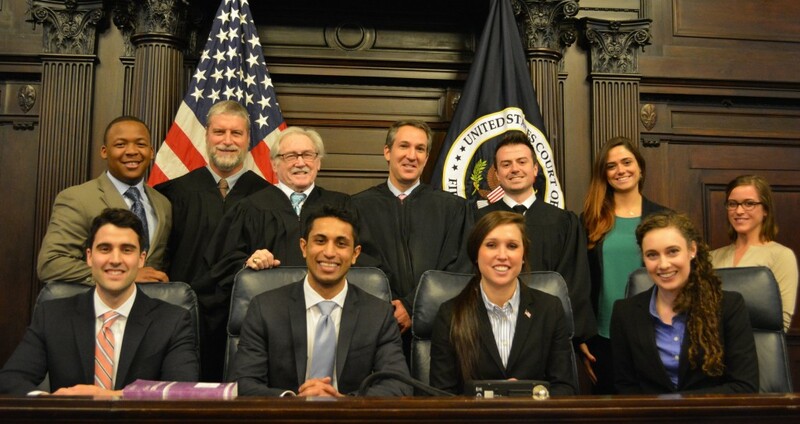 “The practitioners are genuinely interested and eager to learn about the issues in the problem, making for intense and highly interactive oral arguments,” said Shauna DiGiovanni (L ’15), moot court administrative justice for invitational competitions. And it’s only fitting that Tulane hosts its annual competition the week before Mardi Gras, when competitors can partake in quintessentially New Orleans traditions during downtime. Demetrius Sumner (L ’15), Assistant Dean Jim Letten (L ’79), retired attorney Joe Ettinger (L ’56), Professor Gabe Feldman, attorney T.J. Henry (L ’13), Shauna DiGiovanni (L ’15) and Jennifer David (L ’16) join finalists Joseph Kammerman and Vino Jayaraman of Cardozo School of Law and Laura Grubb and Katelin Eastman of Pepperdine School of Law to celebrate a successful competition. 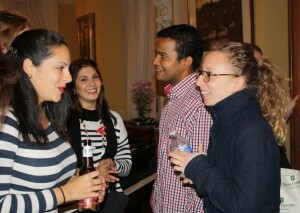 Zhandra Marin (LLM ’10, SJD ’14), Wanadi Molina (LLM ’15) and Lara Vuillequey (exchange student) chat before the Muses parade. 4. 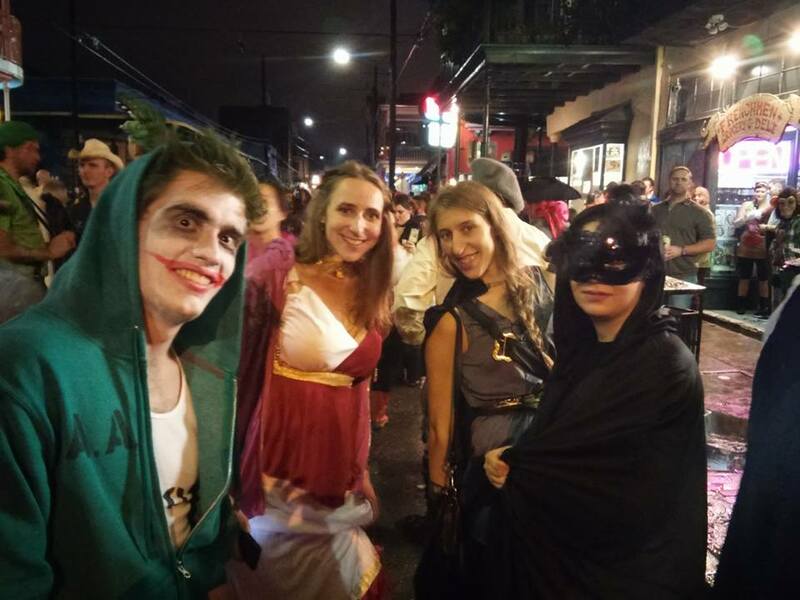 Camaraderie is infectious during Mardi Gras, and Tulane Law students explore New Orleans together like never before – whether it’s their first or their 30th carnival. 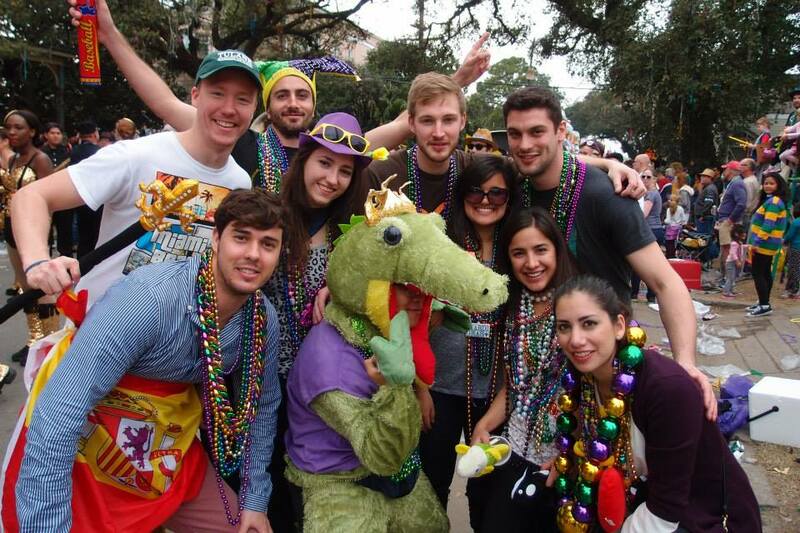 Seeing Mardi Gras for the first time thrills New Orleans newcomers, but Tulane Law’s international students, who come to study in the city for just a year, get a special view of the fun. Professor Herb Larson, executive director of international legal studies and graduate programs, and his wife, Julianne, welcome Tulane’s international students to carnival season with their annual dinner before the Krewe of Muses parade. Students gather at the Larsons’ uptown home for traditional New Orleans fare, like jambalaya and mini po’boys, then vie for beads and coveted hand-decorated shoes at the parade. 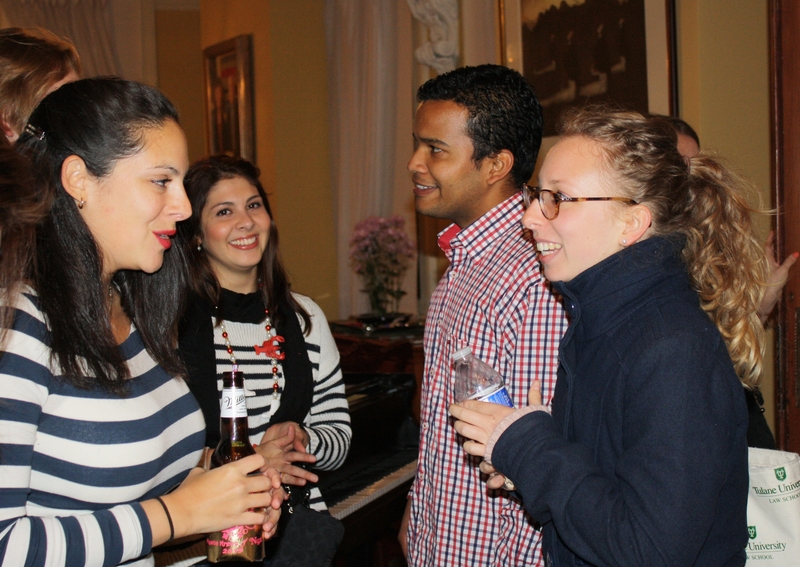 Sharaf Asgarova (LLM ’15) samples Creole cuisine at Professor Herb Larson’s Muses dinner. Photo by Rubaiyat Rahman. This year’s Muses party was only the beginning of the weekend’s celebrations. 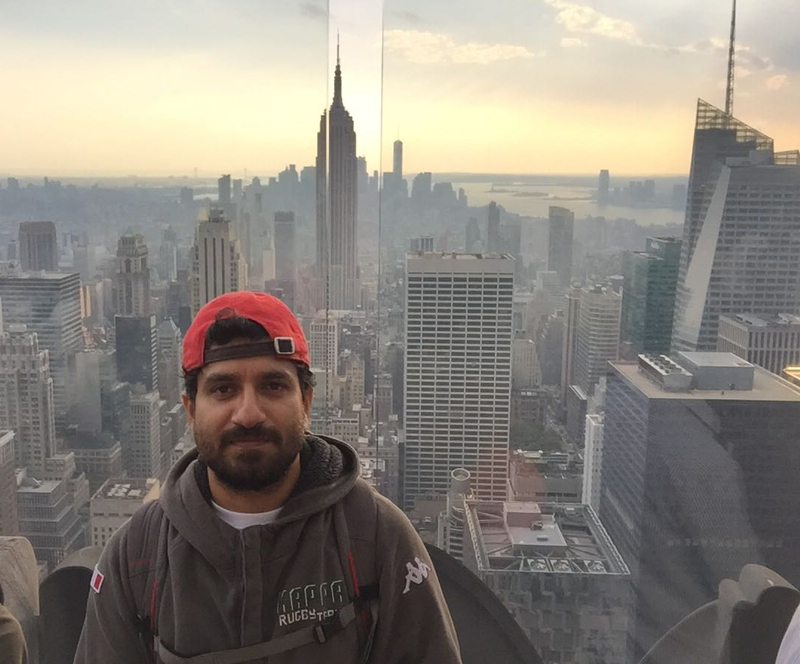 “It was my first ever Mardi Gras and it was a superb experience… Definitely a cultural experience I will not feel anywhere else,” Indonesian student Januar Putra (LLM ’15) said. But, as Chinese student Dennis Zhao (LLM ’15) noted, the best part of Mardi Gras for many students was the fellowship it fostered. “For me, the greatest moment is to spend time with international friends… the whole international family getting together to share happiness,” Dennis said. 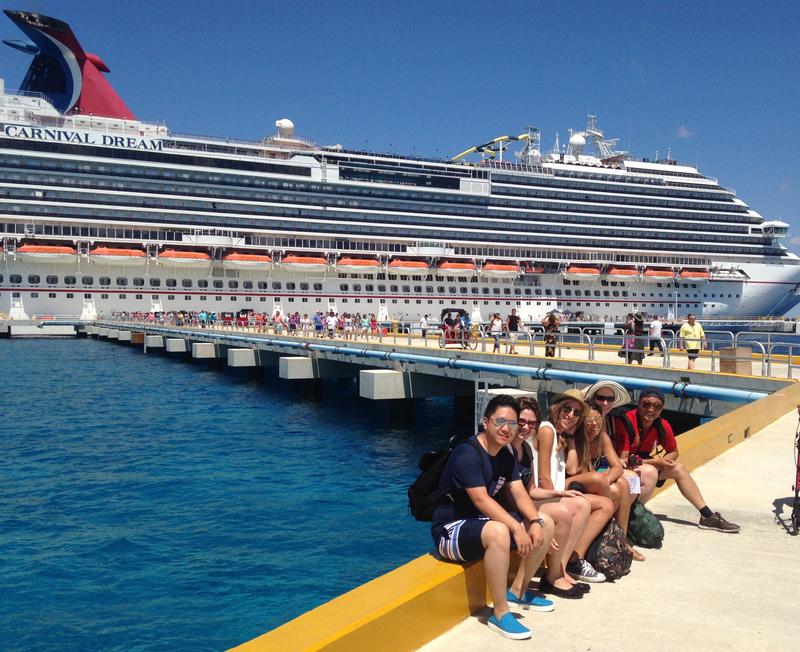 Enrique Rubio (LLM ’15), Dennis Westerink (exchange student), Nathan Sarkas (LLM ’15), Dennis Zhao (LLM ’15), Justus Langelittig (LLM ’15), Claudia Juárez (LLM ’15) and Iliana Ibarra (LLM ’15) enjoyed the Krewe of Mid-City’s parade together on St. Charles Avenue. Photo courtesy of Claudia Juárez. 5. For most places in the world, Lundi Gras and Mardi Gras are just an ordinary Monday and Tuesday. Here, they’re days of vibrant celebration (and Tulane Law School holidays). Who can argue with two days off, especially when they’re packed with so much energy and excitement? 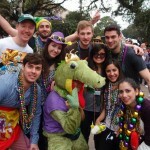 This entry was posted in New Orleans, Student life on February 19, 2015 by tlslagniappe. 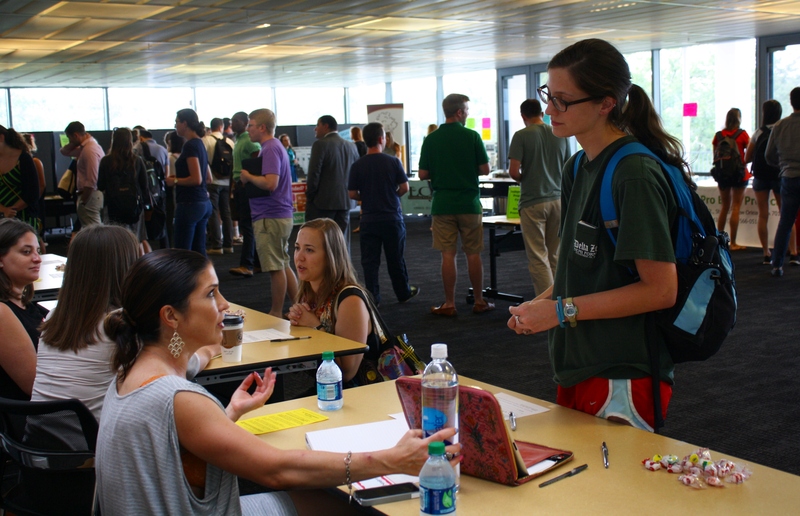 Law students meet with representatives from a variety of local public service programs at Tulane Law’s Pro Bono Fair each fall. Photo by Ali Mansfield. With the fall semester winding down, Weinmann Hall seems quieter as students hunker down for finals. But that only temporarily masks how active the past few months have been as students juggle classes, extracurricular activities and service to the community. 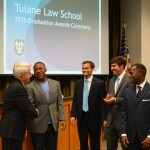 Tulane Law values its leadership role in public service. Tulane was the first U.S. law school to require pro bono work as part of the curriculum, and students collectively have provided more than 200,000 service hours during the program’s 25+ years. 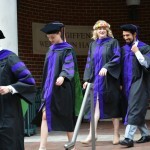 Other schools have added pro bono to their graduation requirements, but even Jeopardy! 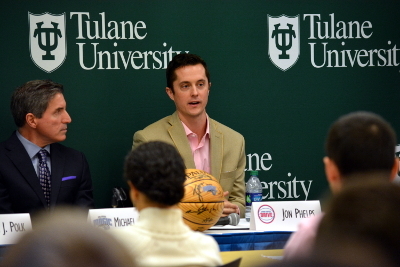 recognizes Tulane’s distinction as the leader: it was a clue on the show in October. New Orleans is an exciting hub for art, music and drama. But how can upcoming artists afford to protect their interests in the often-cutthroat entertainment industry? 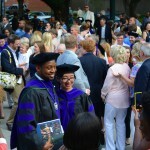 ELLA, a collaboration of Tulane Law School, the Tipitina’s Foundation and the Arts Council of New Orleans, provides legal advice for performers and artists. 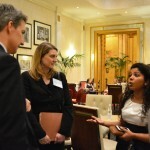 Students help clients protect their interests and recognize their rights under contract and intellectual property law. 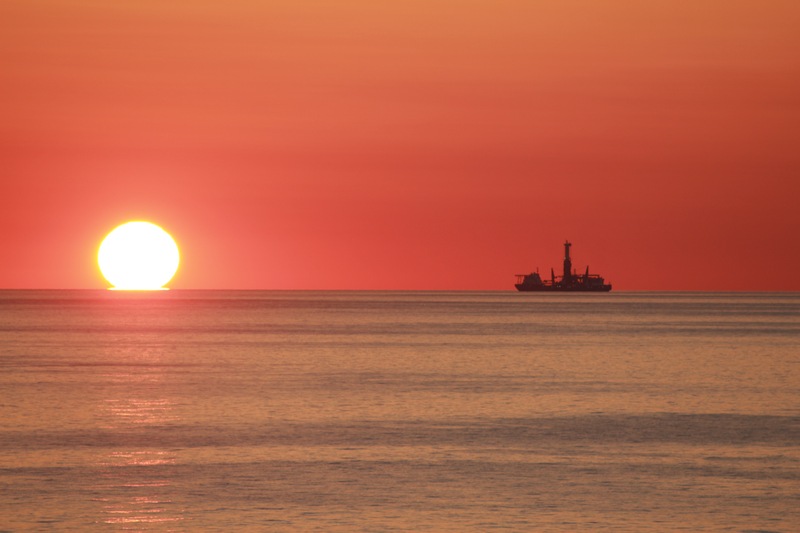 One of south Louisiana’s less-celebrated claims to fame: its rapidly eroding coastline. 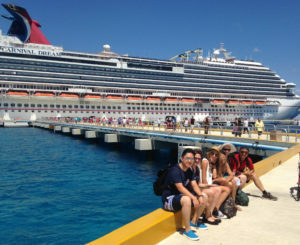 But students can get involved in ongoing efforts to save the coast through legal channels and raising public awareness. 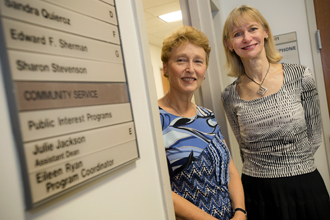 Public Interest Program Coordinator Eileen Ryan and Assistant Dean Julie Jackson help place students in a host of unique service opportunities locally and nationally each year. Photo by Paula Burch-Celentano. The GRN is dedicated to protecting and restoring the Gulf Coast, and it offers law students invaluable experience in environmental law. The GRN tackles water quality, sustainable fisheries, smart energy, hurricane rebuilding and endangered species protection. Law students at the GRN may review permit applications, help develop corporate accountability resolutions and perform legal research. Eden House, a residential program for victims of commercial and sexual exploitation, provides exposure to the legal issues surrounding human rights violations. Founded and run by Tulane Law graduate and former U.S. diplomat Kara Van de Carr (L ’98), Eden House connects its clients to various rehabilitative services, including legal aid. And cities across the nation are now looking to it as a model for supporting human trafficking survivors, Jackson said. Tulane’s newest pro bono offering is with the U.S. Department of Homeland Security, providing a chance to see the operation of an office within a vast federal agency. 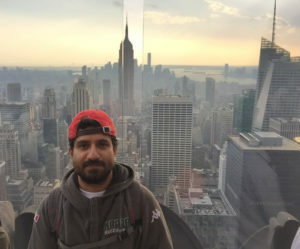 Although the department offers assignments covering an array of legal projects, much of the local DHS office’s work pertains to immigration issues, a key area overseen by the department and one where students can get timely experience in immigration law. 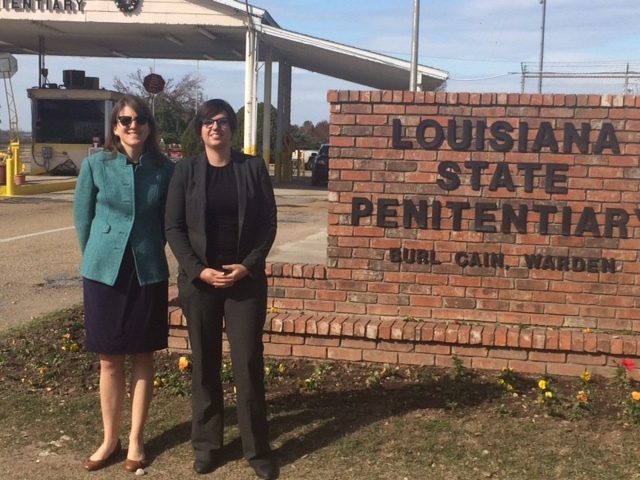 Caroline Wick and Angela Pokorn (both L ’15) attend a hearing for a POPS client at Angola Penitentiary. that may be better utilized for younger, higher-risk inmates. Under the supervision of Tulane Law alumna Suzy Mixakis (L ’03), POPS successfully represented four clients this fall. “Students learn to interview the clients and also see the correctional system from the inside out, which is an invaluable experience for all citizens, as well as for future lawyers,” Jackson said. This entry was posted in New Orleans, Pro bono law, Student jobs on December 9, 2014 by tlslagniappe. There’s no shortage of ways to celebrate Halloween in New Orleans. You can parade with Krewe of Boo. Take in frighteningly creative costumes in the French Quarter. Cheer on Tulane football in “Ghoulman” Stadium. Krewe of Boo paradegoers wave at the floats, hoping to catch the Halloween parade’s signature New Orleans-themed throws. Throw me something, Chucky! 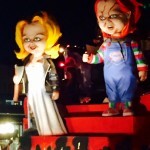 The doll and his bride make a creepy entrance at the annual parade. 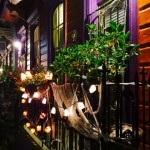 The Marigny neighborhood features some of the city’s best Halloween decorations and celebrations. Photos by David Weinberg. 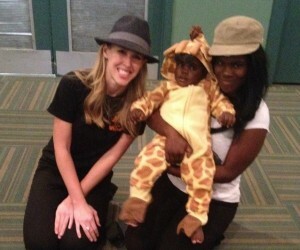 But Tulane Law alumna Kelsey Meeks (L ’10) spent Halloween a little differently. This year, she launched ‘WEEN DREAM, a national nonprofit that makes Halloween accessible to kids in need. The New Orleans-based organization matches new and gently used costumes with children whose families otherwise couldn’t provide them. ‘WEEN DREAM founder Kelsey Meeks (L ’10) helped costume baby Kanye as a giraffe, allowing him and mom, Kierra, to celebrate Halloween in style. Photo courtesy of Kelsey Meeks. Meeks, a Wall, Bullington & Cook attorney and lifelong Halloween devotee, said she founded the organization believing that all children should get to participate in Halloween – regardless of the financial, medical or personal difficulties they may face at home. board pitched in to outfit a child. But there’s more to be done. Even though ‘WEEN DREAM provided hundreds of costumes this season, over 800 kids applied. The group lacked the resources to outfit them all. Meeks’ game plan? The Louisiana State Bar Association already helped ‘WEEN DREAM set up post-Halloween costume drop locations statewide. The organization is planning pilot programs in other cities to expand donations nationally. The group is also throwing a black-tie costume party/fundraiser on March 28 at the Mortuary Haunted House – where part of the haunted house will be up and running. Meeks has much work ahead to meet her goal of costuming all of next year’s applicants, but she said she’s proud of what ‘WEEN DREAM accomplished so far. ‘WEEN DREAM Board Members Valerie Gernhauser (L ’09), Kelsey Meeks (L ’10), Alli Scott Craig and Tara Benoit-Rodrigue (a 2014 Tulane Continuing Studies grad) sort donated garb so kids in need can dress up for Halloween. Photo by Paula Burch-Celentano. And she credits much of the group’s success to legal skills. The nonprofit’s board members include three other attorneys (Valerie Gernhauser is a 2009 Tulane Law grad) and a paralegal, and they were able to file all their own incorporating and tax exemption documents. Meeks said her law school experiences — gaining interest in public service, learning to lead others and developing organizational skills on the Tulane Law Review — prepared her to launch ‘WEEN DREAM. “What I did at Tulane Law gave me the confidence to go out and build this organization instead of waiting and hoping someone else would start it,” she said. 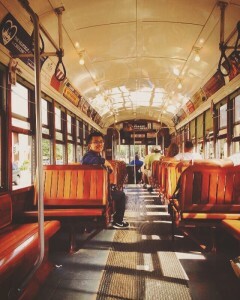 This entry was posted in Alumni, New Orleans on November 6, 2014 by tlslagniappe.